What types of drinks you are serving? What events and locations need to be stocked with cups? If you need more than one style of cups (hot beverages and cocktails don’t usually demand the same cup style!)? Before you get overwhelmed, check out our party cup ordering guide. We’ve also listed some suggestions to get you thinking what types of cups will be best for your wedding reception. Customize your wedding cocktail hour with personalized frost flex cups in the perfect size for cocktails — 9 ounces. This classic cup size ensures that your guests get that full-glass-feeling for every signature drink that you serve. 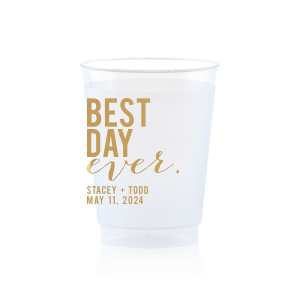 Your customized frost flex plastic cups give you the opportunity to personalize every celebratory sip that your guests enjoy! Say “cheers!” to custom plastic frost flex cups at your wedding cocktail hour. With over 50 screen printing color options, designing wedding cups to complement your décor will be a snap. Will your wedding bar be serving both cocktails and beer? If so, you’ll need more than one size of custom wedding cups to keep the cocktails from seeming puny in a big cup, and the beer from seeming like a teacup serving. A great solution is ordering 10 oz frost flex cups and 16 oz frost flex plastic cups with coordinating or matching designs. Serve wine and cocktail in the 10 oz cups and beer in the 16 oz. Your bar will be fully stocked and ready for drinks of all sizes with these two sizes of personalized frost flex wedding cups! Your destination wedding welcome cocktail bar sets the tone for your entire wedding weekend. Start your celebrations off right with personalized party accessories like custom plastic cups! With over 20 cup colors, including the always fun color changing mood stadium cups, you’ll have total creative freedom to coordinate your personalized stadium cups to your destination wedding theme and colorway. Bonus: stadium cups are reusable, so you’ll be serving welcome cocktails in cups that your guests can take home as a memento of your fabulous destination wedding. Custom stadium cups for the win! What drink goes best with that gorgeous spread of treats on your dessert bar? Mmmm, hello! Coffee, of course! Make sure your dessert bar has custom styrofoam cups to extend your wedding theme all the way to the last delicious sip of coffee! 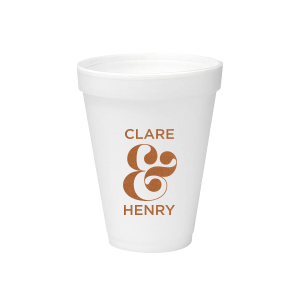 Our personalized styrofoam cups are the perfect option for keeping those hot drinks warm, and your guests’ hands comfortable. Maybe your wedding plans are more casual, and involve bottles of beer on ice and cans of LaCroix. 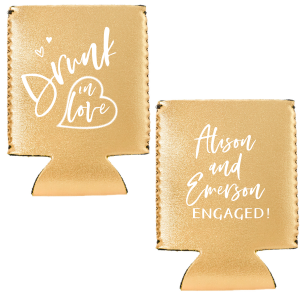 To add a layer of personalization to even the most casual ceremony, offer your guests wedding koozies! Not only will your custom koozies keep their hands dry while they imbibe, you’ll be giving them a memento to enjoy for tailgates and football seasons to come. It’s a perfect personalization alternative, when cups aren’t needed! Whatever your plans are, there is a custom cup solution! 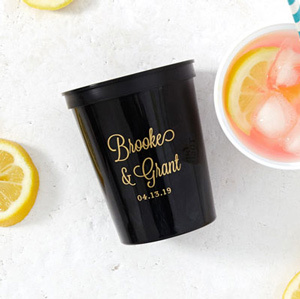 You’ll be so glad that you took the time to think carefully about all of your personalized wedding cup needs when you see your guests enjoying their cocktails, beer and coffee, all in perfectly suited personalized wedding cups. Cheers to that!